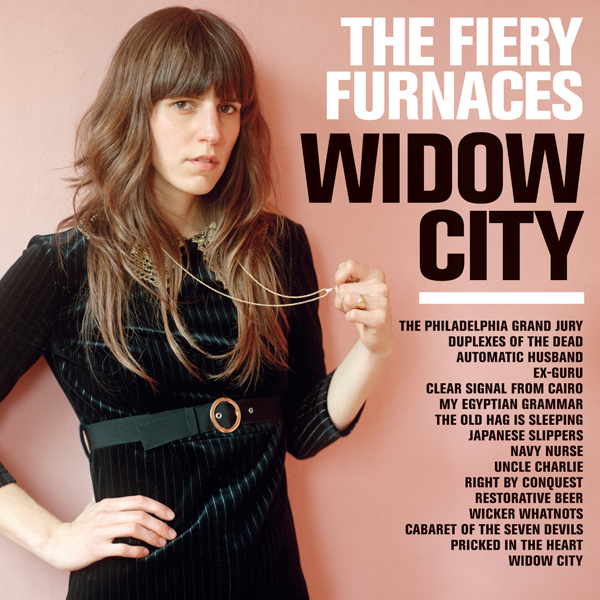 The Fiery Furnaces have really outdone themselves here. After 2003's brilliant, schizophrenic pop masterwork Blueberry Boat, it seemed impossible to know where the New York City sibling duo would turn to feed those two insatiably creative minds. It turned out to be in the dense introspection of 2005's Rehearsing My Choir, a record based on the Friedberger's grandmother. Critically and commercially disregarded, The Fiery Furnaces marched on, delivering the half-baked crypto-pop of Bitter Tea in the spring of 2006. Continuing their LP-a-year output (Radiohead take note) 2007 will be remembered as the year in which the Friedbergers marched further out to pop's peripheries to land on their most exhilarating, alien soil to date. Widow City is quite simply staggering. A record reeling its own individuality, the album sees the duo adopting new instrumentation to challenge old adversaries, these being traditional notions of song structure, timing and theme (Yes!). As before Matthew takes charge of instrumentation and production, with Eleanor providing vocals and lyrics. The combination has never been more effective. Widow City sees the premiere of the Chamberlain, a keyboard instrument which triggers taped loops of other instruments to create a torrent of sounds. Set opener 'The Philadelphia Grand Jury' embodies Widow's subsequent anarchic sonic palette perfectly. Over seven mind-melting minutes, 'Philadelphia's' landscape segues from locked-down guitar and drum funk to layered shoegaze guitar, from a simple upright piano progression into a full-throttle distortion-heavy rock out; all the while Eleanor delivering indelible melodies completely unphased. Eleanor's perfomances on Widow City are some of the most daring and powerful of the duo's output. Arresting imagery abounds, from the colour of a womans cheeks "the colour of dead jellyfish lying on the beach" to the Duplexes of the Dead and beyond.... Widow City is French cabaret, dance-hall sing-alongs, Led Zeppelin riff rock, unashamed pop...It is all and none of these, it is quintessentially The Fiery Furnaces; a compelling, unique beast.